In my last post I talked through the Trattorini (small tractor) culture of Italy and much of southern Europe with a specific focus on mid scale permaculture plots from 5-40 acres. Farming on this scale benefits significantly from mechanization as the endeavor reaches a scale that begins to measure harvests in tons rather than pounds. That scale is also out of the traditional scope of this blog, so this post and another in the near future will focus on my tool recommendations for farming on smaller scales. Working backwards, lets talk about a small, intensive operation from .5 to 2 acres producing between 5000 to 80,000 pounds of produce. 8hp Lombardini Diesel, Berta Rotary Plow mounted on a Grillo 85D chassis - its one sweet tool. Tools like my Grillo 85D (pictured at right) are extremely well suited to operations at this scale. I ordered it from Earth Tools and had them custom mount the 8hp Lombardini diesel engine from the 107D to better handle the Berta Rotary Plow and also because I loved the idea of having an Italian made engine on my Italian made tractor pulling Italian made implements. I am dorky that way. The 85D is just smaller than middlin in the realm of two wheel trattorinis. BCS makes tractors much smaller, but they are limited in their use. the “D” part of the name is very important as it designates a locking differential. This is the similar to a limited slip differential in a car or truck in that it provides power to both wheels at once, effectively doubling the traction available at any time. This is very important when using heavy working implements like the Berta Rotary plow. The difference is that a locking differential does exactly what it sounds like – it locks the wheels together. This makes turning all but impossible –a very good thing when you are working down a 200′ row and do not want to stray off line. At the row end, throw the engagement lever and within 3′ the differential unlocks and you can turn the tractor fine for the next row. Line up the tractor, throw the lever again and you are back to arrow straight work again. Grillo also offers larger models such as the 107 which has another working speed as well as brakes, and the monster 131 with a massive frame that can handle a 16hp engine and the biggest implements with ease. 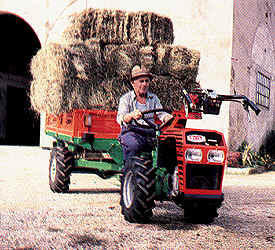 As your acreage goes up, the larger tractors can be justified with their ability to run wider tillers and mowers to cover ground faster, use powered 1000# dump trailers effectively turning the Grillo into a 4wd mini truck (friends have seen entire families going to Church on them in Portugal), and even the almighty spader which is the holy grail of “restoration” tillage. Next up lets talk through the PTO, which stands for Power Take Off. Trattorinis at this scale (BCS also makes a very good unit, though they are better known and you pay several hundred more for the name recognition) come with a PTO mounted opposite the engine. The PTO allows the engines power to be “taken off” the transmission and used to power an implement (more on that in a bit) by simply attaching with two bolts. Earth Tools even offer quick couplers for a reasonable price – making the swapping of implements a truly 2-3 minute affair. Given that the implements can weigh more than 100#’s it is a worthwhile investment; swapping by hand with wrenches only takes about 10 minutes, but can be tricky to balance the implement with one hand and turn the wrench with the other. The tractors are designed so that the implement weight counter balances the engine almost perfectly – and those implements that need more weight, such as the rotary plow have longer tongues providing for a bit more rear bias to the weight distribution. Even still about 40#’s of lift is all that is needed to pull the plow out of the ground and a transport wheel is provided for moving between fields. Photo from the Earth Tools site showing the handles rotated for "front" PTO use. In the last post I discussed how incredibly useful it is to be able to rotate the drivers postition so that the front of the tractor has the PTO. Two wheel tractors come equipped so that the entire handle bar can swing 180 degrees allowing the tractor to be run with the PTO in front for snow blowing, mowing, or hay baling (yes they bale hay!). The addition of moveable handles also allows you to offset them so that you walk next to the tractor, outside the tilled area so that the soil is not compacted or disturbed leaving a clean bed for seeding. Having a PTO is the most important attribute of these tools, truly converting them into tractors that can do every thing form working soil to mowing to blowing snow to chipping brush. The engine is the single most expensive component of a mechanical tool – having a trattorini with a PTO allows you to buy a fantastic engine like my Lombardini, and use it to power all your jobs rather than having to buy multiple tools with multiple engines – all needing maintenance and the upfront cost. 4wd powered off the PTO - these machines are incredible! The amount and and variety of work that can be one with this scale trattorini is simply astounding. Have a wood lot? Then check out the chippers and log splitters. 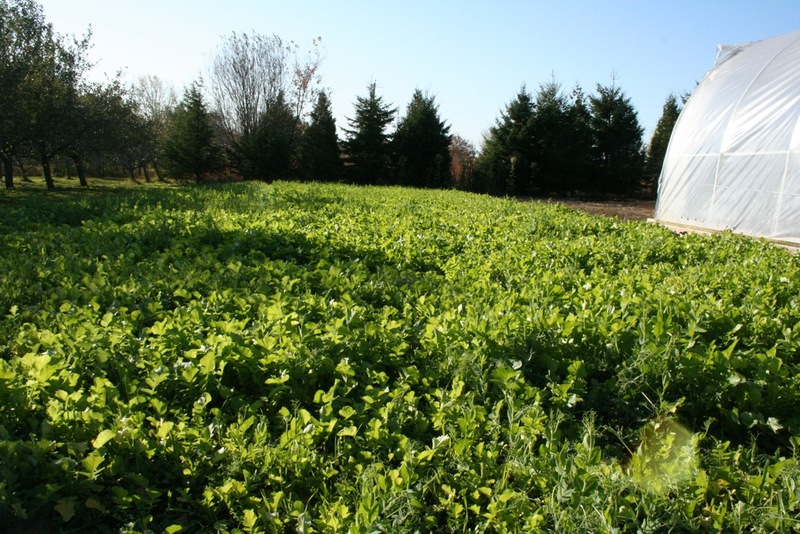 Pasture or cover crops? Find flail mowers, sickle bar mowers, hay baling equipment to make 60# round bales, and tedders. 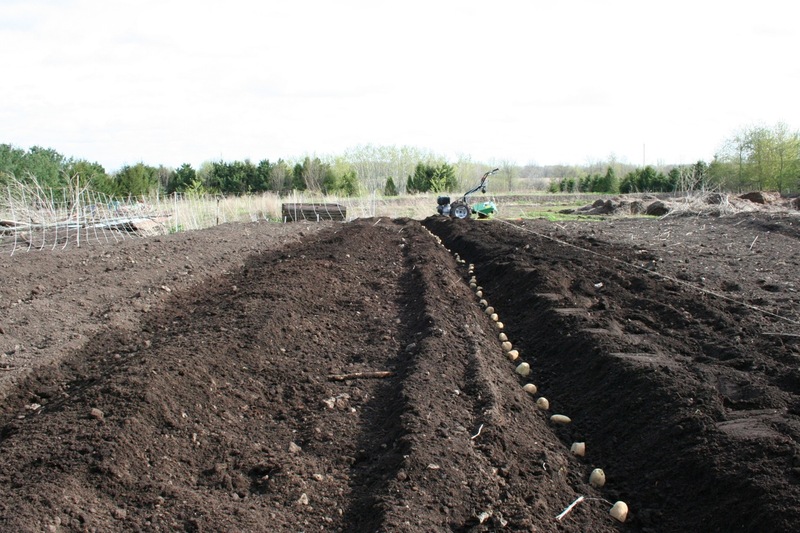 Soil working is the bread and butter of most tractors and the options are legion: tillers, power harrows, rotary plows, spaders, even split tillers allowing the cultivation on each side of a row of seedlings. Seeding, power washing, you name it, there are implements to do it. The picture above shows the most mind-blowing of the options for these tools – hook up a trailer to turn the tractor into a truck – this model is powered by the PTO, and even includes a steering wheel and hydraulic dump, though non-powered trailers are available too. Tractors allow the farmer to stretch their time, skill, and knowledge to accomplish feats of agriculture far outside the ability of hand tools alone. Using tractors at this scale also fits in well with Energy Descent – in the 2 years I have used my Grillo I have yet to use 10 gallons of fuel despite rugged use not only at my home and market gardens, but also in tilling in new gardens for numerous friends. With 2 years into my Grillo here are some learnings I would pass on. First off, if you can justify the $5000 that I spent for my 30″ tiller ($600), rotary plow ($1200), and custom 85D ($2800), then there is likely alot of work to be done. In that case I would highly recommend buying the 107 (or similar scale BCS). 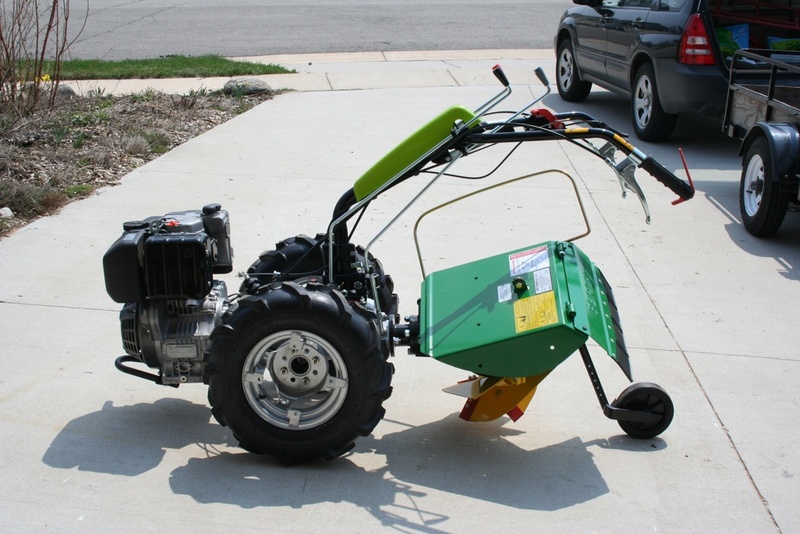 The larger tractor costs about 20% more ($500), but is a great value as you get another working gear for mowing, brakes for working on grades and for steering while mowing, and the option of using a powered trailer. Even if those don’t sound useful now, these tractors will last 20+ years and I think it prudent to give yourself the flexibility for future use. Not getting the 107D is my single regret. Cover crop broadcast by hand and tilled in with 30" tiller. Gorgeous! Implement learnings. I have a 30″ tiller and a Berta Rotary plow and if we get acreage I would purchase mowing equipment to try to convert to no till. I use the tiller primarily for seedbed prep and incorporating cover crop seed by running it over the broadcast seed in 2nd gear with the tiller set on the lowest setting – this increases germination about 300% to broadcast alone. Tillers are close to useless for breaking sod or incorporating cover crops unless they have been chopped up by a flail mower (which I don’t have) as the plants wind around the tines almost immediately. 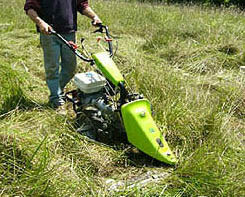 Tillers are rough on the soil when run to their full depth as they beat the soil to death – literally. A new addition to the trattorini tool box is the 24″ power harrow. This unit work by stirring the soil s little as an inch deep to prep the seedbed and I would very much like to see one in action as I think it would do the job of my tiller, but better. 75' row of potatos dug by a Berta Rotary Plow. 2' to the left is a row filled by the side discharge. Slick! The Rotary plow is a simply an outstanding tool for cutting ground for annual crops or tilling in standing cover crops. It laughs at standing plants – turning under everything from 6″ thick quack grass sod to 6′ tall Lambs Quarter (don’t ask how I know this…) and incorporates it fully. It also creates what is essentially a double dug bed in no time flat and due to its side discharge can dig mini-swales all over to help with water harvesting. 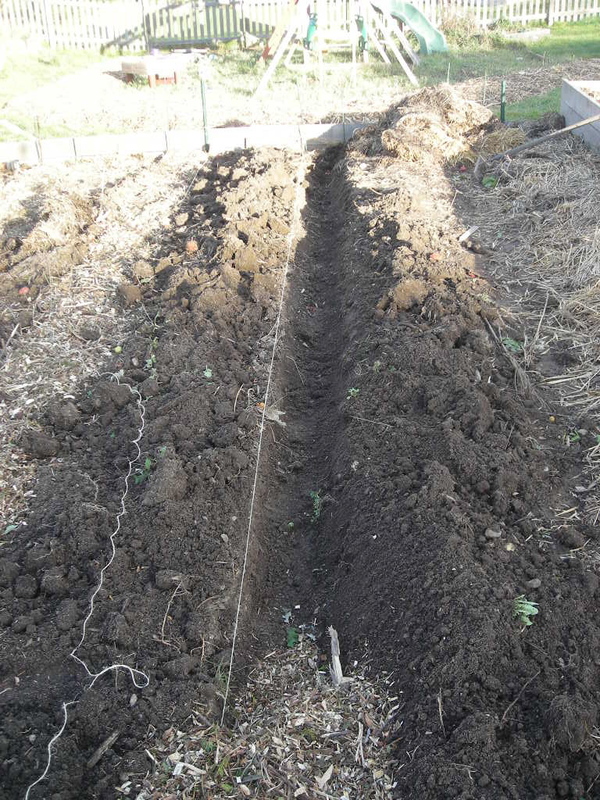 Finally, it is perfectly suited for potato growing – the trench it digs is ideal, and it will even throw the soil back over your seed as you dig the next trench. If you space your rows out, you can also use it to hill your plants. HUGE time savings. For what it is designed to do, I am convinced it is without peer. That said it turns everything under to a depth of at least 1 foot, deeper than is good for a healthy soil ecosystem and it can be strongly argued that it fluffs the soil *too* much. It is a great tool for building gardens, but has limited use for maintaining them – something to consider before dropping $1300 on one. For annual tilling, if you are unable to go no-till, a spader is the best choice as it does not invert the soil layers, but to run one you need the Grillo 131, which is almost twice as expensive and spaders are also double the cost of a rotary plow. A Grillo 131 with a spader will set up back almost $7000 – dang. Other awesome tools that are close to “must haves” at this scale are a mini seed drill like an Earthway which allows you to plant your seeded crops wicked fast –literally only as long as it takes you to walk the row and comes with a variety of seed wheels to accommodate everything from lettuce to corn. For cultivation it is near impossible to beat a good wheel hoe. Glaser and Valley Oak both make great tools that feature the proper design that uses the cutting implement as the fulcrum saving the operator strain as well as interchangeable blades – even offering double wheel configurations that allow you to straddle a row of small plants. A vigorous operator can hoe 1-2000′ or more in an hour and the rhythm is almost meditative. Two wheeled trattorini are not cheap, but they fill a gaping hole in sustainable agriculture between a good digging fork and a 40hp Kubota. My tractor cost me $5000, but has paid for itself in 2 years through produce sales by allowing me to grow 4000#’s of potatoes on less than 5 hours of work a week for half a year using only 5 gallons of fuel a season. In addition it has helped give birth to community gardens, rain gardens, and provided the inspiration for countless others. I literally could not be doing the work at our market garden without my Grillo since I have a full time job. Appropriate technology can make small scale agriculture sustainable simply by making it possible, enjoyable, and profitable. I definitely think that having the Grillo has expanded our horizons greatly. If you’re interested in large-scale organic no-till systems, you might search Youtube for “weed em and reap” videos. They show systems that rely on seed drills and don’t chop the vegetation at all (killing is by frost or crimping), among others. There’s even a mechanized potato planter that barely disturbs the soil at all. Fellow Grillo Brother! Here is my 107D in all it’s glory. We have made short work or our little plot of land, and are now helping others to get moving with backyard gardens. It’s always difficult when I explain to my friends what a 2-wheel tractor is … they just respond … that’s no tractor … I disagree. Enjoying your tractor postings very much. Nice summary of the benefits of two-wheeled tractors! We purchased a used BCS 737 last year and it rocks. I second the recommendation for a unit that has both a differential lock and wheel brakes – the 737 has both and find them extremely useful. Another benefit of the walk-behind tractor is the multitude of other implements not directly related to gardening that you can run – snowblowers, log-splitters, I’m waiting for someone to come out with a generator attachment. PS – If you are a Looney Tunes cartoon fan you should most certainly consider the older BCS models. I smile every time I look at the large Acme brand engine on our 737. Thanks Rob! That’s exactly what I was looking for. Are the 85D handles beefy enough to lift the rotary plow out of the ground when it’s good and sunk? I have heavy clay and I’ve broken a walk behind tiller handle twice by horsing it. I’m also thinking about going no-till, but there seems to be little or no trattorini sized equipment. I’d love a little weighted planter with a coulter, double disc opener, followed by a seed firmer. That’s a little beyond my fabrication skills. If you get the rotary plow, then one must upgrade the G-85d to the 20″ wheels to provide clearance when transporting the plow. Really, just get the G-107d, I have both. The G-107d gets 90% of the use. It has brakes for steering, and it can accommodate the driven wheel trailer. Once again, that requires a wheel upgrade. How much would a UTV cost that can haul a ton? It is just another attachment for a Grillo G-107d!!! Oh, one more thing: Have you seen the open-source homebrew tractors that Factor e Farm has been working on? They have a walk-behind as well as an articulated 4-wheel, and it looks like the system is even more modular than your Grillo (although the design is on the opposite end of the elegance spectrum…). It would be interesting to see what would happen if some extremely low-cost competitors entered the market. Very cool. Can I just be a dork and point out that in Italian it’s a ‘trattorino’? ‘Trattorini’ is the plural. Sorry, couldn’t stop myself. Ha! I think I used it right about 40% of the time… Graziei!